First, let me say that I believe many people are somewhat apprehensive and even reluctant to make any financial or travel transactions over the Internet with companies that are essentially unknown to them. But after a few back-and-forth E-mails, I felt as confident as I would have been dealing with a trusted friend. And speaking of E-mails, you wrote more than once that "the mountains await." Every time I felt the guide and I had taken a long enough rest break, I would tell him perhaps we should mount up as "the mountains await." As you know, I am 72-years old, and I was told that I have taken the age record away from some young guy who was only 62 years of age. Proves one is never too young to have a long ride on a Minsk with Explore Indochina. I had chosen the 8-day NW tour based on the route and sights described in your Website, except I customized it to include the city of Dien Bien Phu. Visiting the Museum and Memorial was particularly meaningful to me as the 50th anniversary of the French defeat approaches on May 7th. On the second day out of Hanoi, I suffered a triangular puncture cut to my left calf while trying to navigate a muddy, slippery trail. I take full responsibility for this as I did not advise the guide that while I have rode cruiser bikes for years, I had no dirt bike experience. If I had made that point, I am sure an alternate route around this area would have been selected. But my able guide/linguist/mechanic would now also assume the duties of "bac si." He performed the necessary first aid techniques on a daily basis that allowed me to continue the tour until I could get western medical attention upon return to Hanoi. I had planned this trip for far too long and was enjoying it far too much to abort the trip for a reason such as this injury. Even though I had spent 6-years in what was South Vietnam during the "American War," and bi-monthly working trips to Hanoi and Ho Chi Minh City since the mid-80's, I had never experienced the vistas presented to me on this tour. Every description in the Website of the areas we visited was accurate to a fault. We saw vistas and landscapes and tribal hill people that are indescribable. We rode on mountain trails that were no more than muddy foot paths on the edge of drop-offs of thousands of feet. We crossed rickety, 3-foot wide bamboo bridges without side rails. Some roads were like foot paths or cattle trails, some surfaced one lane and a few two lanes. We rode up and down mountain roads with a 10 percent grade, and that means sharp hairpin turns and "S" curves. Meeting oncoming trucks and buses on those curves can be spooky and require extreme awareness and concentration. Some roads were hard-surfaced, some crushed rock, some gravel, some slippery ruts, some very bumpy, some horrible, you name it. But the weather was the best imaginable for February in northern Vietnam. No rain and warm most of the time. The coldest was at the old French hill station on SaPa, which is on the highest mountain range in Vietnam. The fireplace in the hotel room certainly helped offset the evening chill. SaPa also offered some of the best glimpses of life in minority villages that we encountered. Which reminds me that I must make the point that the guide not only explained the customs and differences of the lowlanders and the various ethnic minorities that we met along the way, he proved to be very knowledgeable of the cultures of the multitude of indigenous peoples. This added immensely to my understanding of their conduct, beliefs, fears, etc. 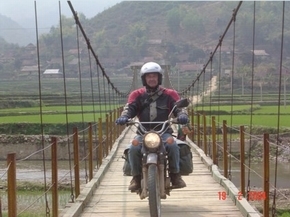 After SaPa, we rode to Lao Cai on the Chinese border. Here we drained the petrol from the bikes and loaded them aboard the night train to Hanoi. We enjoyed the comforts of a 4-person compartment which enabled us to have a few hours of sleep before arriving in Hanoi at 0430 hours. All in all, this tour has to rank high in unusual adventures, and I cannot recommend it or Explore Indochina too much. In fact, I am already considering taking the NE tour later this year or early 2005. all his pics!